General endurance is the foundation of any sound training program from the 5K to the marathon. This is the training mode where we distance runners spend 70 – 90% of our training mileage, including the long run. And yet, many of us fail to run easy mileage at the correct intensity. Often we end up with near marathon pace and therefore underdeliver on key workouts on other training days. The purpose of easy runs and long runs is to build up general endurance and injury resistance. They are the pre-condition for your faster quality workouts on other training days. 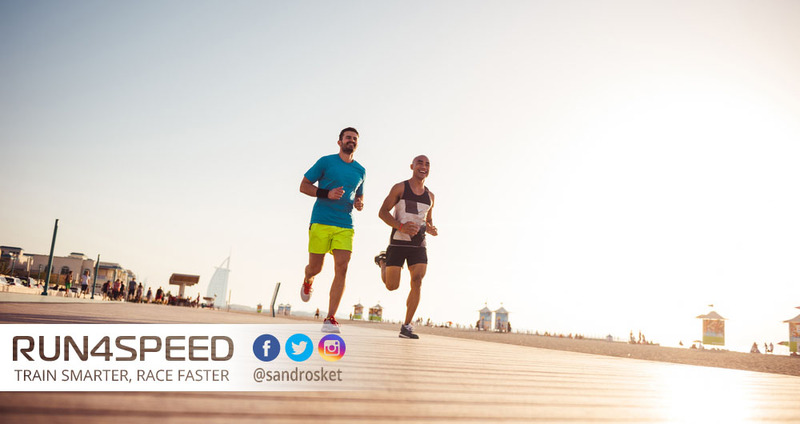 Easy runs should be in the range of 60 – 70% of VO2max in order to single out slow-twitch muscle fibers, enhance their mitochondrial density, and enlarge their glycogen storage capacity. The best way to control your easy run intensity is a heart rate monitor. Use the ‘Karvonen method’ to determine the appropriate easy run heart rate zone. The formula: ((max HR − resting HR) × %Intensity) + resting HR. For a runner with a maximum heart rate of 190bpm and a resting heart rate of 45bpm it would be ((190 – 45) x 65%) + 45 = 139bpm target heart rate for the easy run. You will notice that your heart rate drifts over the length of the workout. The reason for that is the accumulation of heat in your body and the recruitment of less economical type IIa fibers as your type I fibers fatigue. That’s ok. Slow down the pace accordingly. However, keep your heart rate above 60% of VO2max at all times to stimulate the necessary adaptations for this type of workout. On the other hand, running easy runs faster than prescribed will not result in a significant gain of further adaptations but lead to longer recovery times. Inevitably you’d have to pay the price by underperforming on your key workouts, such as VO2max intervals, tempo runs, and track repetitions. In other words; you may win the battle on easy days but lose the war on quality training days. The length of your easy runs depends on your training level and race distance. As a rule of thumb, for every race distance you move up, your easy runs/long runs become 30 – 40% longer. (Note that you don’t have to double up on easy runs just because your race distance is twice as long.) For example, a 6 mile easy run for the 10K becomes roughly a 9 mile easy run for the half marathon. At the very least you would want to have a mid-week easy run and a long run on the weekend. In that scenario your mid-week run is roughly 70% the distance of your long run. If you run on more than 4 days/week then you can add additional easy runs. In terms of time, an easy run should last at least 30min to be effective and long runs start at 60min in duration. There’s also the option of ‘doubles’. Running twice a day, where your second run is executed on partially depleted glycogen stores is a viable alternative to running easy/long runs in one go. Not only will you produce less of the stress hormone cortisol, but you will reap the benefit of elevated growth hormone levels twice. That is if your lifestyle allows for 2 runs a day occasionally. Keep the training volume of your easy runs reasonably high throughout the entire training year with a slight increase over the years. Exceptions are taper periods, short recovery cycles after longer races, or the off-season. Only the rather demanding long runs fluctuate in length over the course of your different training cycles, even week by week in the case of extended long runs. The key takeaway of this article: Don’t run easy runs faster than prescribed just because you can. I myself slip into the comfortably hard training mode of marathon or tempo pace occasionally simply because I feel more accomplished. But don’t be fooled. There is little to gain but much to lose. You will inevitably pay the price by being overly fatigued at your quality workouts.